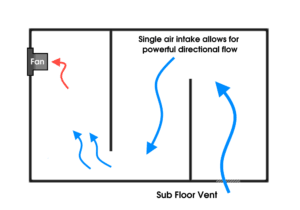 Why is Sub Floor Ventilation important? 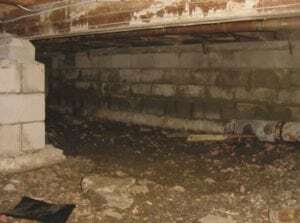 Chances are you haven’t checked your sub floor space in a few years. Perhaps are you’re looking around online because you’ve been told your sub floor has seen better days! A perfect breeding ground for white ants, termites & borers! High moisture levels can lead to irreversible damage to the structure of your house. Repairing your sub floor space is no cheap fix—so why risk having problems in the first place? If you have high humidity, poor indoor air quality, you’re risking the health of the home occupants. Solar Whiz offers powerful solar sub floor ventilation. We’re serious about protecting & safeguarding your home’s sub floor. Don’t risk your greatest investment becoming an expensive repair job—no home sub floor should be a problem. Solar Whiz offers a wide variety of fan kits, each suited towards extracting different volumes of air. Every home is different—some large, some small, some with lots of sub floor space, and some with none at all! We offer a variety of fans, each of different sizes & ventilation capacity. We understand that sub floor vents need to cater to a wide variety of homes. In the scenario one of our fans doesn’t fit, we can also make use of our other inline fans to tailor a sub floor vent solution just for you! Our fans are connected to roof (or even wall-mounted) Solar PV cells. These ensure that your system runs when you need it most, and can even run in low-light conditions like overcast weather! If a Solar-style setup doesn’t suit, we can even set up a 12-volt power pack plugged into a 240-volt power point for underfloor ventilation all day long. These fans are set up to draw air through sub floor vents set up around your sub floor. Depending on the home, we can offer a variety of installation methods to achieve the results you need. If you have a brick sub floor with little to no air intakes, we can map airflow through your sub floor space. We can duct, or we can even extract air through the roof via a roof-mounted Solar Whiz! By using a split ducting system, we can create multiple air intakes through your sub floor. This allows the sub floor extractor to draw air from multiple spaces of your subfloor, creating cross-ventilation that covers almost the entire floor space. This is one of our most popular installation methods. A single duct allows you to channel air to specific locations of the house. If a single sub floor vent is installed, it will allow you to draw air from specific regons of the sub floor. If sub floor space is too limited, we can also offer roof-mounted sub floor ventilation. 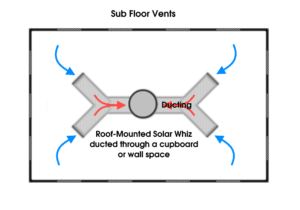 By ducting a Solar Whiz roof ventilator down to your sub floor, we can offer powerful extraction that won’t be affected by limited sub floor space. 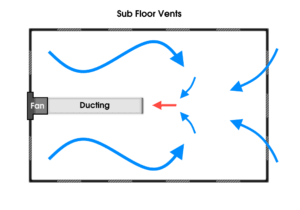 If you have segmented sub floor space, or would like to map & channel airflow through your entire sub floor space, the push/pull method allows you to move air through the sub floor from one end to the other. 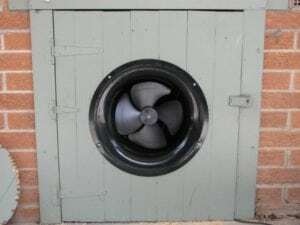 What else should I know about Sub Floor Ventilation? If your sub floor ventilation requires more than just strong airflow, we can help you keep it dry with SAM: Solar Air Module! By ducting a SAM unit into your sub floor space, you can treat any moisture & damp issues with warm, dry air. This supplements any Solar Whiz Sub Floor Ventilation perfectly. If you want your underfloor ventilation to run around the clock (not just when the sun is out!) then a constant current module is right for you. We simply add a module to the pre-existing Solar system that allows your fan to top up power from mains electricity if solar charge is depleted. With a reliable Solar Whiz Sub Floor Ventilator, you don’t need to worry about condensation or wet & dry rot. You simply have it installed, and have the peace of mind that your sub floor’s health is in good hands. If you’re interested in finding out more about Sub Floor Ventilation, check out our brochure. Interested in getting your Sub Floor looked at? Contact us for a free, quick quote!